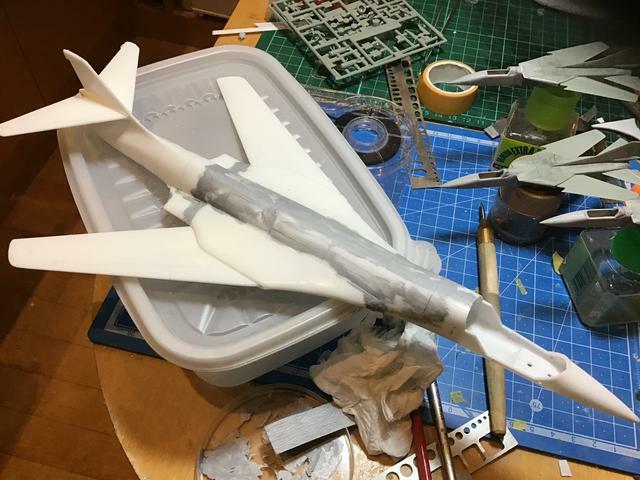 So, while every other one of my 1/144 Area 88 projects were on hold while I waited for eBay to deliver me some top secret supplies (although the front end of my MiG-23BNs arrived and the Bloody Screw (re)build is underway again), I decided to dust this one off the shelf. 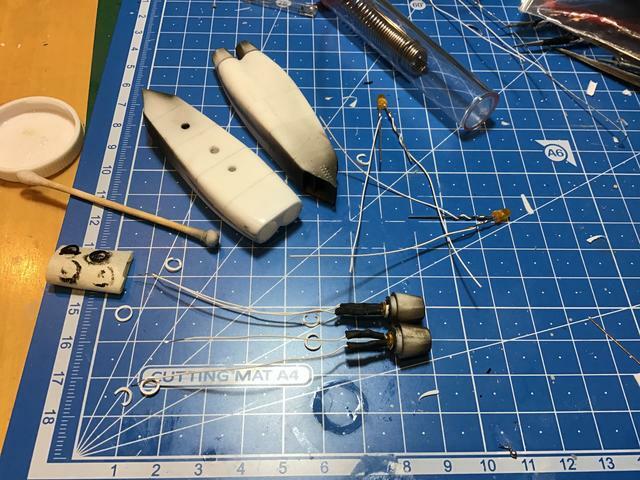 This Lindberg 1/144 B-1 Bomber was originally purchased with this project in mind, but then I decided to repurpose the kit for my 1/72 scale Tintin Carreidas 160 build. 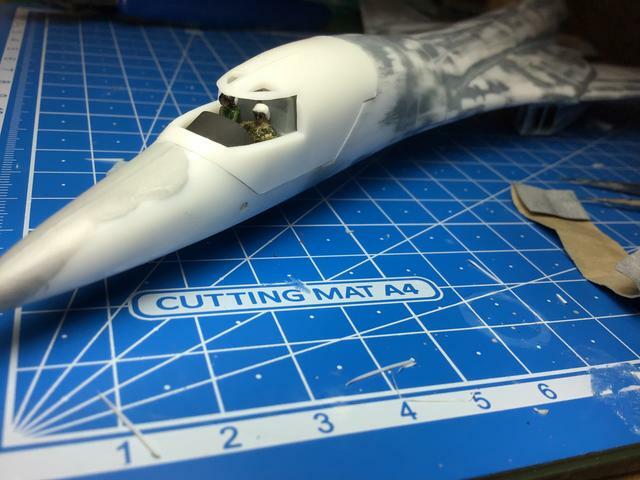 So I cut off the back end and taped it to the backside of a 1/288 (or something) 747-200. 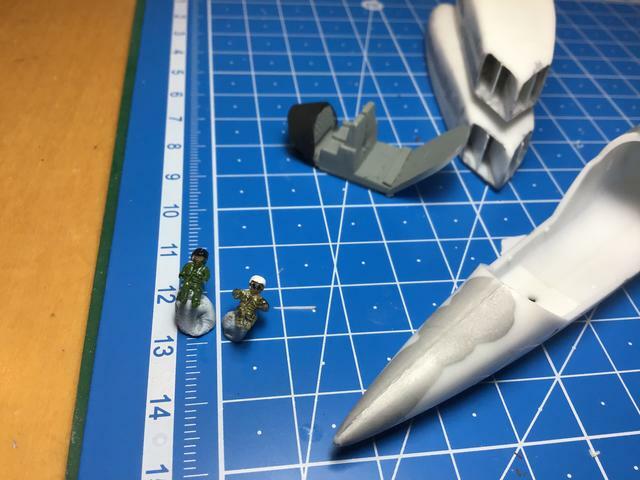 I still want to see that project come to life, but I miscalculated just how small the cockpit area would be for a 1/72 scale build. That turned out to be a game-breaker for me. I hummed and I hawed about how to make it work... but in the end I decided I just didn't want to cheat as much as I would've had to. So I'm back to scribing panel lines. But there are both a lot and not enough of them... so I took a break to fix up the cockpit a bit. I moved the control panel into the more proper upright position and covered it with a dash. It now makes a passing wave at reality... instead of having the crew fly the plane with their feet. Back to scribing... and still more to do. Ahhhhh... I had been wondering what had became of the Carreidas 160. Finally able to provide a bit of an update on this project. The scribing took forever... mainly because I was lazy the first time around and had to (re)move extra lines. The wings especially needed a lot of work. Why did nothing line up? Of course the rest of the body wasn't much better, to be honest. 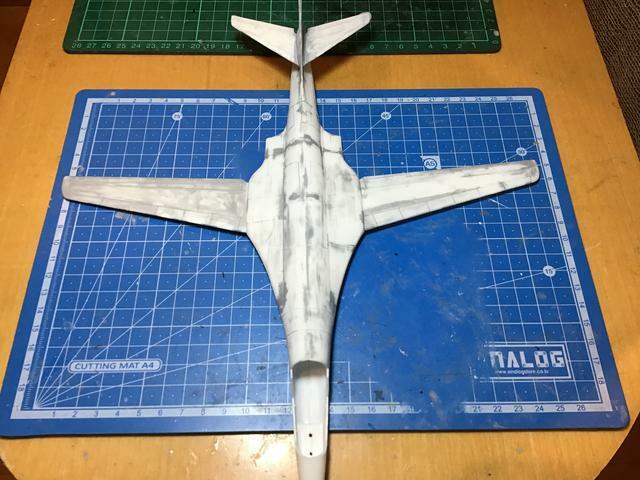 It finally got to the point where I needed a bit of paint to prime and cover the sanding so I could hide the confusing lines that were already fixed and just bring out the defects that still needed to be addressed. 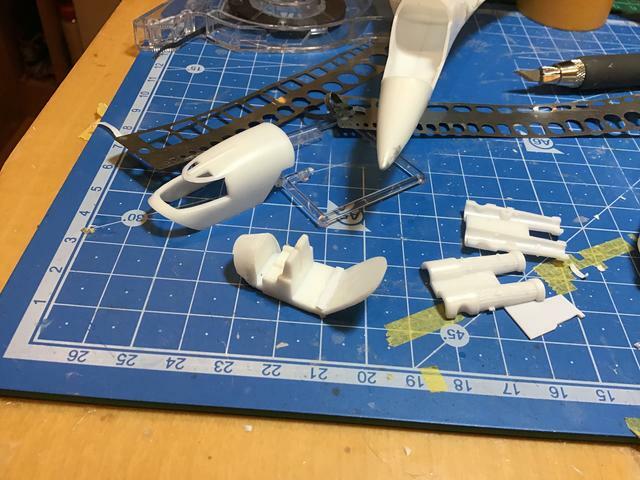 After the bulk of the sanding was complete, it was finally time to box in the engine nacelles. Lots more sanding here too. The walls need to be a lot thinner. 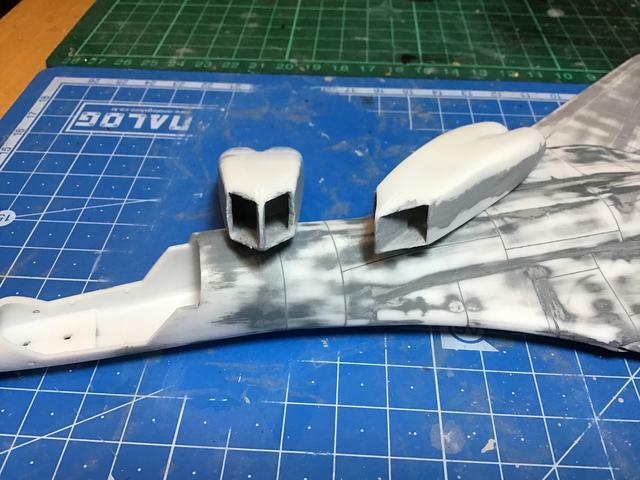 Since it’s going to be a closed cockpit, I was able to get away with some relatively crappy resin casts for the pilots. Hello Saki and... co-pilot! Thanks nighthunter. As I mentioned, since they're in a closed canopy, I didn't spend too much time on them. However you can actually see more than I thought (at least before masking) so maybe I should've spent just a bit more time with them. 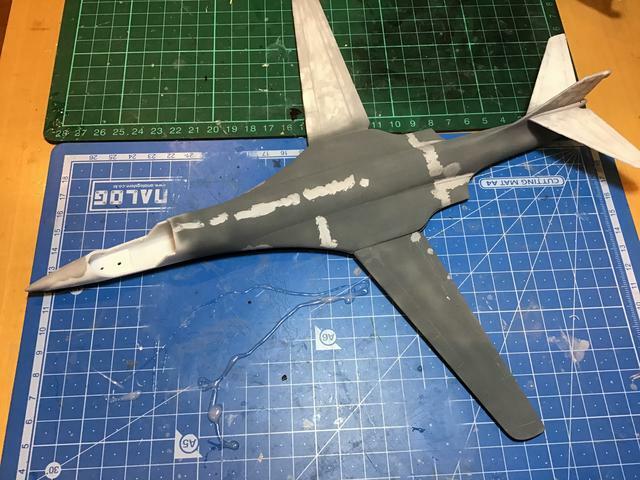 I waffled back and forth on this project, but I really do love the B-1, it's got such great lines. And the project is supposed to illustrate an exciting episode from the Area 88 manga series - with the giant underground drill bomb "The Grand Slam" getting closer to the Area 88 base by the minute, the guys devise a plan to create a hole in the ground with some precision bombing before Saki swoops in with his B-1 and bombs the base of a large rock formation called "The Big Leg" and drops it in the hole, stopping the Grand Slam in it's tracks. The Lindberg kit is far from the best, but the project idea is making up for it in my mind. A couple more updates here. First off, I was able to add a few more details to the cockpit. 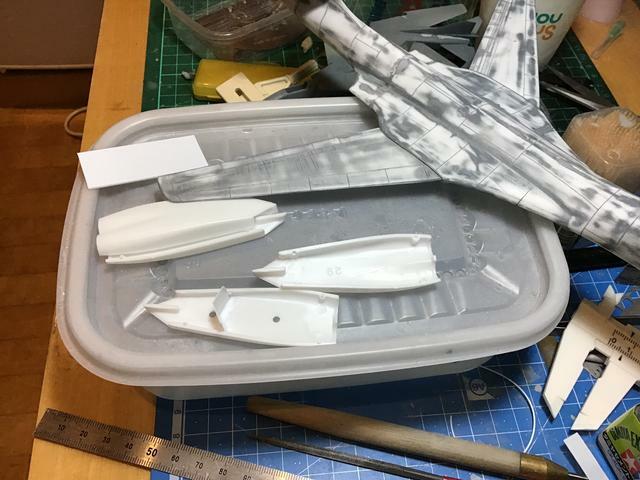 Mainly just some red cushions to the chairs and a bit of drybrushing on the most-likely invisible instrument panel. Then it was time to turn my attention to the engines. Part of the reason I wanted to box off the intakes was because I need to hide some wires for the LEDs. I got some really small gauge (30) "wire wrapping wire" which is a bit trickier to use since it's a solid core. 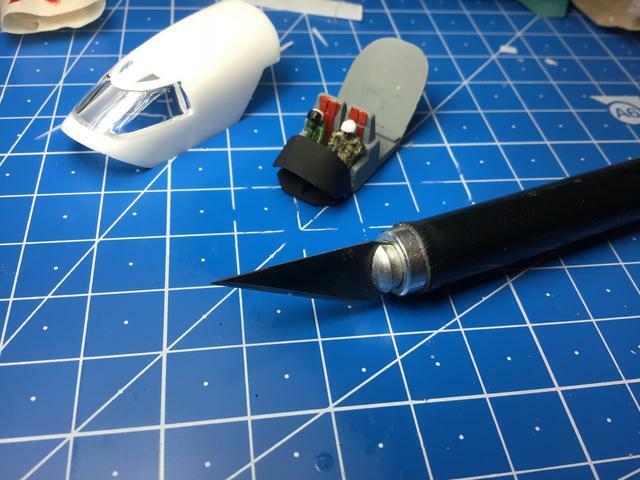 Much easier to accidentally twist off a solder point, but the up side is that it's easier to hide. I'm glad the landing gear panels can be put in place afterwards to cover the hole. 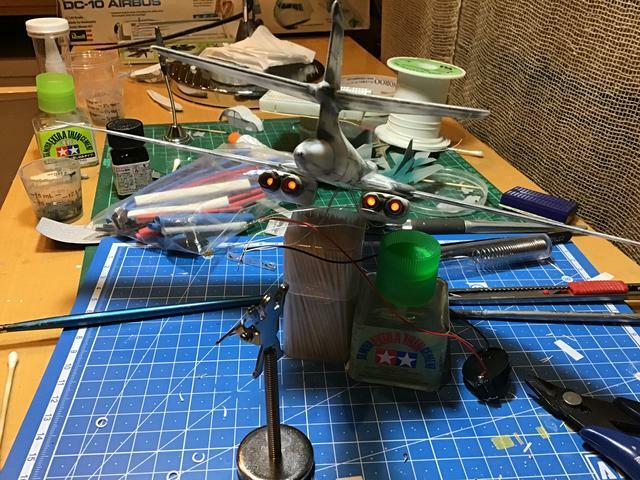 That makes it much easier to feed the wires through the engine nacelles, the wings and then get soldered together inside the body. That way I only have a pair of wires coming out of the plane instead of eight. Just a quick test and it works! The LEDs are just about the perfect brightness too. 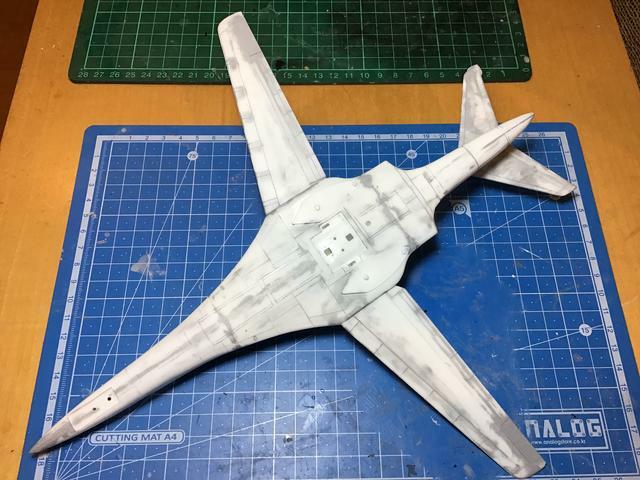 Since it's a semi-translucent white plastic, I was a little worried about light shining through the skin of the plane, but it's just the subtle look I was going for. ...the giant underground drill bomb "The Grand Slam" getting closer to the Area 88 base by the minute, the guys devise a plan to create a hole in the ground with some precision bombing before Saki swoops in with his B-1 and bombs the base of a large rock formation called "The Big Leg" and drops it in the hole, stopping the Grand Slam in it's tracks. I must concur wit' me esteemed zenrat. I probably wouldn't use that adjective to describe Zenrat, but I certainly concur re the kit. So this looks like a good place to ask. 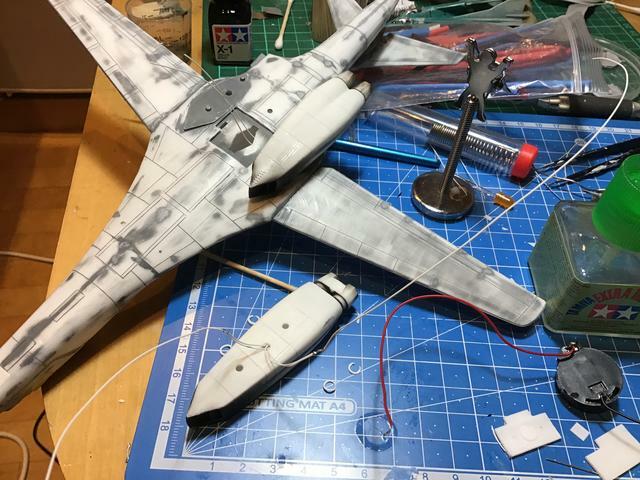 What's a reasonable, not-silly-priced B-1 kit in 1:144? A friend is a big fan of the Bone and casually quipped that it'd look great in RAF wrap-around camo. So off I quietly went to Hannants expecting to just be able to pick from a range of options. But... nothing? Even eBay can't offer anything except from outside the UK. Any suggestions of a kit I should watch for on eBay? It doesn't need to be super-accurate, or even a B-variant*, just something that'd make a reasonable canvas for a WHIF. Ta! Thanks guys. 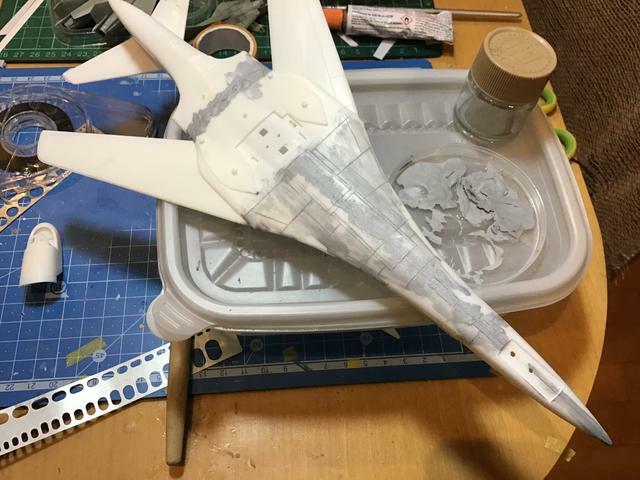 I got the masking done yesterday, so after a couple of last minute touch ups, it should be ready for some real paint. AS.12 I think the answer to your question is probably this kit, the Lindberg 1/144 B-1 Bomber. I’m pretty sure there are only three options, this one, the Dragon one and the Minicraft one. The Dragon one seems the best, though I’ve not seen it up close and personal. It’s also the most expensive. The minicraft one is a rebox of a kit as old or older than the Lindberg, so in my opinion it’s rather over-priced. You should be able to get the Lindberg box for about $15 I think. It’s not bad, although the raised panel lines bear little resemblance to reality. Thanks for that! I'll set an eBay alert for the Lindberg one.